Bahamas weddings are magical affairs of warmth, sunshine, beaches, sea and romance. Few countries in the world can offer the range of locations available across this group of islands, and they are rightly known for their ability to provide couples with an unforgettable, worry-free day. However, it’s quite easy to get lost in the romance of the imagery. Weddings are, of course, also major exercises in logistics and organization that have to be thought about seriously as well as romantically. In the Bahamas, weddings are easy to organize and just about everything is readily to hand. That includes those priceless things such as sunshine, sea, beaches and sub-tropical luxury that come as standard. You can also count on marvelously friendly people that will do everything within their power to make sure your day goes well. However, any wedding, anywhere in the world, can result in fiasco unless you plan ahead. So, if you want your memories to be pleasant ones, here are a few things to think about in advance rather than leave to chance. The Bahamas is a sovereign and independent state. English is the official language and the state has its own very straightforward laws relating to marriage. It’s a smart idea to familiarize yourself with these requirements well in advance. Note that if you and your intended spouse are of different nationalities, the marriage license requirements for each of you may differ slightly. Firstly, you will need to be resident in The Bahamas for 24 hours before your marriage. As is the case in almost all countries, if you have been previously married and divorced, you will need to provide original copies of the final and irrevocable divorce statement. If this is not in English, you will need to also provide English translations. Depending upon your marital status, you may need to provide a sworn affidavit relating to it. For some nationalities this can be done in your home country (as is the case for UK citizens) but for others it may be necessary to do it locally. In most cases, all these formalities for Bahamas weddings can be arranged well in advance and the marriage license is valid for 90 days after issue. Leaving things until a few days before the wedding may be risky. Having a Bahamas Wedding is a wonderful experience, as one can make the ceremony quite memorable and remarkable by choosing the Island of his/her choice and have a beautiful occasion on that. The whole ceremony would be taken care of and even one can have a beautiful location for the honeymoon. They are the most considered locations among others. There are various providers that offer the services of organizing perfect Bahamas weddings. You can blindly rely on their services. If you are planning to have a wedding on the weekends, it is vital that you arrive in Bahamas no later than Thursday. It is vital that you are 18 years and above to get married. If in case you are under 18, parental consent is needed. You can count on the professional staff that will help you to make your day a memorable one. It is worth to take a tour of the relevant website for more details on the exceptional services. When it comes to organizing Bahamas weddings, it is highly suggested to seek professional help. They are firm believers of customer satisfaction and offer services accordingly. It does not matter what your needs are, you can blindly rely on their services. They are a perfect location to say your final vows. You will find a large number of people dream to have a wedding in Bahamas. You can contact the experts in case of any queries or doubts. What are you waiting for? Do not delay and have a wedding of your dreams in Bahamas. Surf the germane website for more details. 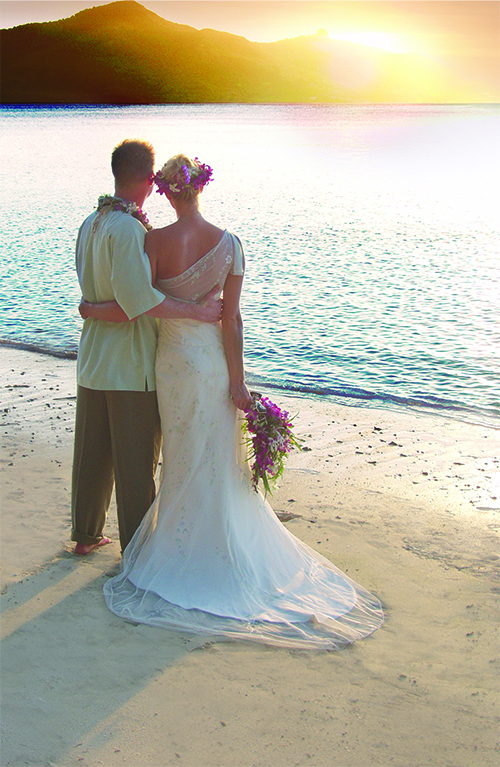 Getting married in the exotic islands of Hawaii is like a dream come true. Whether it’s a simple beach ceremony, a lavish wedding or an attractive old fashioned wedding in a private garden, your destination wedding in Hawaii is incomplete without the right floral arrangements. In this post, you will learn about some visually enticing floral themes that will perfectly blend with the event decor and your individual taste. When it comes to wedding flowers, it is better picking out colorful and hearty blooms that can withstand long hours of display and heat. Only choosing the flowers is not enough, it’s also important to pick the right vases, containers, color scheme, and other ornamental items. Dark blue summer hydrangeas with bright yellow roses can make a great bridal bouquet. With the flowers, there should be arrangements or items to embellish the altar area, the reception table or chairs decorated with colorful blossoms. And, if you want to add more beauty and drama to your ceremony, you can opt for flamboyant orchids. The wedding reception is the most significant part of your nuptial and must include the right flowers and items to spice up the event space. Whether you want to spend extravagantly or want a simple decor, the perfect balance of reception flowers, containers, vases, candles and lighting will create the right reception milieu. If you want to go by popular choice, you can decorate the reception area with red roses signifying love and romance. And, to make your reception decor inimitable, lavender roses are a great idea and a rare choice! Lavender roses are for those couples whose romance bloomed out of enchantment, attraction and love at first sight. Lavender roses are also a perfect complement with white lilies or white roses. No island offers more privacy than Turtle Island. This island is very exclusive and only a few visitors are allowed to stay on this private island. Turtle Island provides a very intimate and romantic experience perfect for couples who have just wed, renewing their vows or would want to re-ignite the sparks in their relationship. There are about 14 beaches in this resort and only 14 couples are allowed to stay here so in effect if you wish to come here with your spouse, girlfriend or boyfriend you could literally have a beach all to your own. This island is also famous for being in a movie before. The movie Blue Lagoon, which starred Brooke Shields, was shot here and the owner of the island was so happy to see people on his property that he decided to turn the whole island into a resort, an exclusive one at that. This island has been described by Conde Nast Traveler as a venue that is hyper-romantic due to its intimate surroundings. Couples can enjoy the best of what life has to offer here with a traditional Fijian wedding or French Champagne gourmet beach-side picnics. They could use the private beaches and private cottages or bures and claim it as their own, even for a little while. Guests could also go horseback riding on the beach, get a soothing massage, or have a romantic dinner by the beach. Everything is possible, and more romantic, here in Turtle Island.